Scottie Lindsey goes up for a layup. The senior guard had a big scoring night in his final home game. 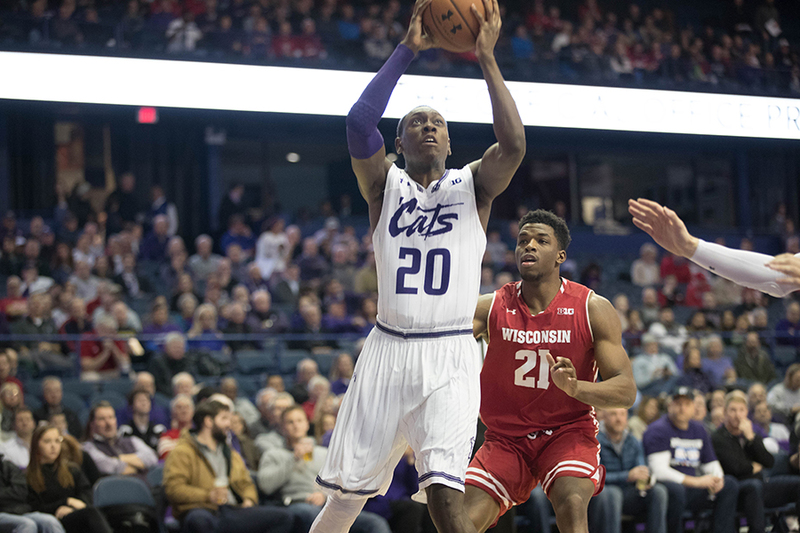 ROSEMONT — Northwestern’s accomplished senior class went out on a low note Thursday night, suffering a fifth consecutive defeat in a 70-64 loss to Wisconsin. Senior guards Scottie Lindsey and Bryant McIntosh composed the vast majority of the Wildcats’ (15-15, 6-11) offense, erupting for 26 and 18 points, respectively. Junior forward Vic Law missed the game with an apparent ankle injury and NU’s shorthanded bench, as usual, contributed little. The game was close down to the wire, but a huge 3-pointer by guard Brevin Pritzl in blown defensive coverage with 29 seconds left tilted it permanently in the Badgers’ (14-16, 7-10) favor. Wisconsin entered the game fourth worst in the conference with a 33.8 3-point shooting percentage this season, but broke from that unflattering stereotype early on, making six of their first nine shots from deep. That hot shooting helped the Badgers hold a multi-possession lead throughout the first half, and another 3-pointer by Pritzl in the final seconds before the break gave the visitors a 38-32 edge at halftime. In the second half, Wisconsin flipped offensive styles completely, almost exclusively turning to grinding post-up plays. That strategy was effective enough to overcome a Cats push out of the break — which briefly gave the hosts the lead with 16 minutes left — and hold the lead for the rest of the frame. 1. Seniors McIntosh, Lindsey came to play. For their final home game of their collegiate careers — albeit in sleepy Rosemont — NU’s two senior guards played two of their better games of their respective campaigns. McIntosh returned from a two-game injury absence and showed no signs of a hampered shoulder, providing life and consistency to the team’s full-court offense. Lindsey, meanwhile, poured in 15 points in the first half alone. 2. Law’s absence has a big effect on the Cats’ defense. The loss of the team’s best and most athletic one-on-one defender was noticeable, even in the hybrid zone. The Badgers’ mediocre lineup outside of star center Ethan Happ was surprisingly efficient, with giraffe-proportioned forward Andy Van Vliet (5-of-7 in the game) especially capitalizing, and Happ (19 points) muscled down center Dererk Pardon in the second half, too. 3. NU is collapsing as the end of February approaches. After moving to .500 in conference with a rousing win over Michigan earlier this month, the Cats have lost five games in a row, most recently going 0-3 in this week’s season-closing homestand. NU is staring down a No. 10 seed in next week’s Big Ten Tournament, which would match it up against the likes of Penn State, Indiana or Maryland in Thursday’s second round. That game could very well be the last the team plays this season.